The city appears to exist under a high-functioning form of anarchy, but it has burgeoning industries and attracts wealthy tourists from Southern California. Before biking into Tijuana, we took a tour of the San Ysidro border crossing, the busiest land crossing in the world. Two agents at Customs and Border Protection generously came into work early to show us what they do day to day. At 7 a.m. the place was already a parking lot, packed with traffic from Mexico. It’s at this choke point that the most drugs and illegal immigrants pass into the United States. The vast majority of drivers are, of course, regular commuters, and searching every car would be a disruption to the legitimate economy. According to some estimates, San Ysidro is worth $1,000,000 a minute to the U.S. economy. San Ysidro is a highly efficient operation, with clean lines, gray steel colors, and strict timetables. But we crossed into Mexico and the atmosphere immediately changed. Just four agents operated the Mexican side. Two of them were young women who flirted with us (complimented my glasses) and handed us six-month tourist visas within five minutes. We quickly crossed a pedestrian bridge and caught our first real sight of Tijuana. From that vantage point, very building seems to rise out of the cracked concrete like an ugly weed, bristling with wires and exposed pipes. Dead dogs lie in the streets. Trash is burned along the highways. I saw a crippled beggar pulling himself with his hands along the highway, sitting on a skateboard. In the city’s center, in the shadow of Tijuana’s iconic arch, there’s nothing but pharmacies with names like “Drugs 4 Less,” strip clubs, and whore houses. The sidewalks are pocked with holes. It’s a high-functioning kind of anarchy. 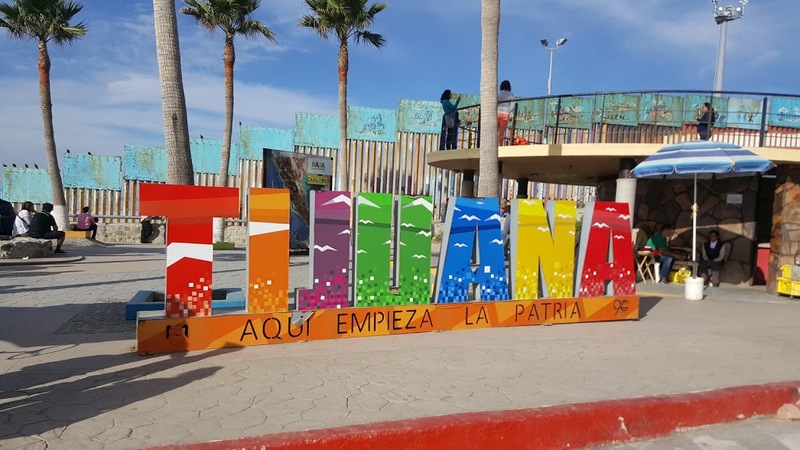 Multiple people have compared Tijuana to an engine, and that’s an excellent metaphor. Engines are productive, necessary, and energetic, but sometimes ugly to look at. San Diego felt oddly quiet, more like a small town than a world-class city. Tijuana is very different. Everywhere you look people are moving, buying, and selling. The streets are bustling with cars, taxis, and buses. Tijuana is now the world’s leading producer of medical technology. Telemarketing is another major industry. There is a growing restaurant and craft beer scene in the city. The U.S. consulate here hosted us at Telefonica Gastro Park, an upscale food truck restaurant. Later we were treated to a beer tour with Turista Libre, that took us to a few of the city’s 90 microbreweries. Everything we tasted was as good as any beer you could find in the U.S. The industry itself is a good example of what places like Tijuana mean to the U.S. All the ingredients, from the malt to the sacks of premium barley, are imported from the U.S. Cheap property prices and Tijuana’s world-renowned culinary arts school have made possible a beer and restaurant scene that now attracts American tourists, rich people from San Diego like the other members of our tour. Tijuana is a chaotic place. The culture shock is real, but I can feel my vision readjusting to the culture just across the border.